@Brooks-- Scumble: incredibly potent alcoholic beverage and signature of Nanny Ogg's home kingdom of Lancre. Apparently made from apples, among other mysterious ingredients. Encore, Boulet! Love the bonus images as well. HOW DO YOU DO THAT?!?!?!? HOW DO YOU KNOW WHERE EVERYTHING GOES!?!? HOW DOES EVERY FALL INTO PLACE LIKE THAT!!!!! AAAAHHHHHH!!!!!! Oh, wow. Boulet, I am constantly in awe of your work, but you have no idea how happy it made me to see you do Nanny Og. Ahh, I'm very envious of your drawing! I must draft every line and cannot draw freely like you do. But it will not get me down, and I will be inspired to get better! Thank you for more wonderful work! 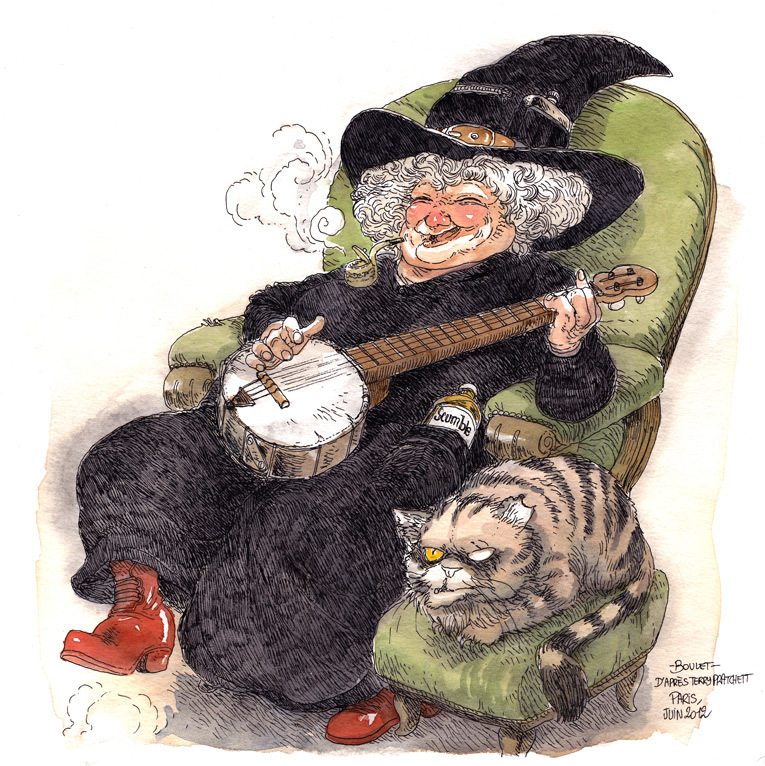 That just might be the best Nanny Ogg-pic I've ever seen! Loved watching the work process. I kept trying to see what kind of pen you used - was it an Aristo? just sooo amazing! many great great inspiring work! and the video - a blast! regards from Lithuania!! You drew that FREEHAND?? Without a sketch or a pencil?? I bow to you, sir. I simply love your drawings boulet!... It's... I can't stop looking for more and more and I watch the videos over and over. You're the BEST!! Can I ask what brand/make of pen that is you're using in the video? It seems to not have a lot of the problems I have with my pen. OK, that's impressive: I knew it was Nanny Ogg before I'd even scrolled down far enough to see her chins.